Nihonbashi (日本橋) is located in Chuo ward of Tokyo Metro. 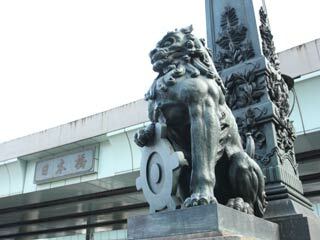 Nihonbashi is the bridge which is the zero-milestone of all Street in Japan since Edo Period. All the distance from Tokyo are majored from here. The bridge, today, is 19th Nihonbachi built in 1911. There are name print which written by Tokugawa Yoshinobu, the last Shogun. The main office of the bank of Japan and Tokyo Stock Exchange is located around this area. There are many shopping mall, such as Mitsukoshi nearby Nihonbashi Bridge. 1. use Hanzomon Line to Mitsukoshimae. 1. use Tozai Line To Nihonbashi. In 1603, the first bridge was built by Tokugawa Ieyasu. He also designed all the roads in Japan, and make this as the zero-milestone. In 1604, it became the beginning point of Five Major Road to Edo. Since then, the bridge appears many times on Ukiyoe Arts. In 1657, Meireki Fire Disaster, the first bridge was burnt down. In 1911, current bridge was built, and registered as national historic asset.